Get your magic wand out now then Liv, because it is time for a very magical, wizarding special. Well, this is the week that an extra on the set of the Harry Potter prequel, Fantastic Beasts and Where to Find Them, got fired for pinching a prop menu and trying to sell it on eBay, and Daniel Radcliffe is still proudly showing off his shaved head. 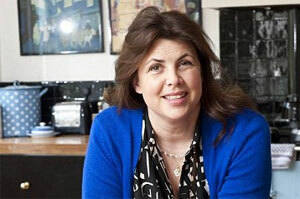 This week, lovely Kirstie Allsopp, off of Channel Four's Location Location Location Location Location with Kirstie and Phil, told the world that she's been touched by a ghost. Blimey Kirst. Apparently it used to lock her mum's car door. Whatever next, a poltergeist in the pantry, a spirit on the stairs, a phantom on the toilet, or maybe even ghoulies in the bedroom? The BBC is very excited about it is new POTTER-Y show, see what we did there, POTTER-Y. It is called the Great British Pottery Throw Down or something like that, where people make pots from clay and then fire them in a kiln. Sounds riveting. We'll have to check that out on iPlayer later, not. With Harry Potter being in the news so much at the moment, what with all the gossip about the prequel movie Fantastic Beasts and Where to Find Them, J. K. Rowling has been doing a number of interviews and seems to have gone and put her foot right in it. She says that the film is set in America, where the word muggle doesn't exist. What? In the film, non-wizards and non-witches will be called 'no-majs' instead (pronounced 'no madges') as in 'no magic'. Exciting stuff J. K., whatever you think best. Well, the nerdy boffin scientists have been at it again, and this time they are hard at work trying to invent an actual invisibility cloak or something like that. They say that it is all to do with the 'refractive index' and manipulating light. However, their cloak is currently only the size of an actual grain of sand, yes that is right, a grain of sand. Sounds about as much use as a dried up tortoise. What?! Dr Helen Czerski at the University College London says that it is all to do with electromagnetic radiation, perpendicular vibrations, meta-materials and nanometres. Fascinating stuff Dr. Czerski. Thanks for letting us know. Daniel Radcliffe is not only a star, but he has just got his very own star, that is a star on the world-famous Hollywood Walk of Fame. At the unveiling ceremony, he was spotted wearing hidden high heels to make himself look taller, as he's only a tiny 5 foot 5 inches. The boy wizard is said to be extremely honoured to have the 2,565th star on the pavement. Good on you Danny boy. Sounds like a very long pavement then, or [AMERICAN ACCENT] 'sidewalk' as they call it in America. And on a similar theme to Harry Potter, although not directly related to the world of wizards and witchcaft, we have some fascinating alien news. Someone that Nia knows saw a TV programme last week that said aliens love strawberry ice cream. Now, we don't know whether they are fussy ice cream afficienados and only like Cart d'Or, or if they would be happy with Lidl's own brand strawberry ice cream. Our reporters are investigating as we speak. So next time you are on the beach and buying a Cornetto, choose your flavours carefully. Oh my goodness. That is shocking. Rupert Grint, better known to most as loveable Ron Weasley, has been busy acting in a new comedy movie, based on a real-life space mission to the moon, or something like that. A trailer for his new film 'Moonwalkers' has just been released, to great acclaim, although it looks like it will be at least a 15 rating, sadly, as it is content has been described as being a bit rude. Based on a true story, reviewers are describing the film as something that will make 'audiences laugh until their brains actually fall out'. Nice description there movie reviewers. And finally, J. K. Rowling is rumoured to be working on a new children's book. We've no idea what it is about, but perhaps it will involve writing and a story, and there may even be a spot of magical nonsense thrown in for good measure. That is about as much as we know about that breaking news item. We'll keep you updated on that story if we find out anything else, which, to be fair, we probably won't, so don't hold your breath. And that was this week's good news.